I know I’m really late starting seeds but chances are good that I’ll end up with some flowers before November here in gardening Zone 7 in spite of very hot temps expected in July and August. I’ll plant the sprouted seeds in partial shade by a sun reflective wall and keep them moist. 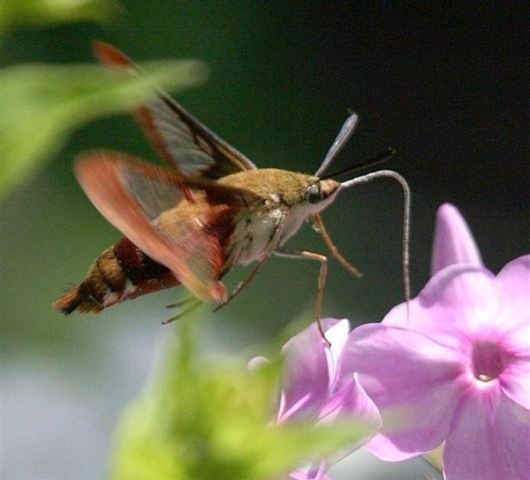 My favorite flowering plant for attracting hummers is Nicotiana aka : Flowering Tobacco. Plants range from compact at 3′ to tall plants at 6′ and flower colors appear in white, cream, green, red and deep purple tones. 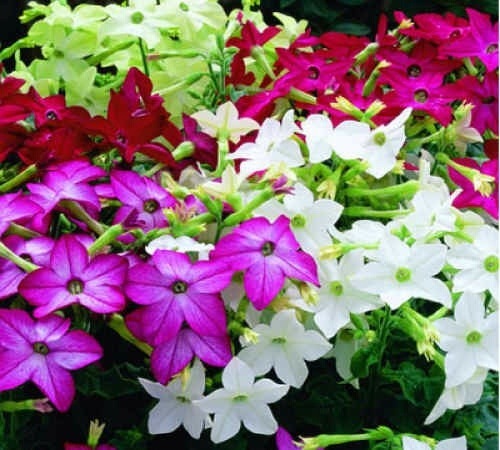 Their trumpet shaped flowers are perfect for hummers and you want to plant Nicotiana near where you’ll be able to watch the tiny birds and enjoy the flower’s powerful scent. I have also had my Nicotiana visited by Hummingbird Moths, a rare visual treat. 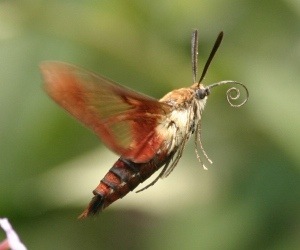 (NOTE : Hummingbird moths are hard to spot but I’ve had them buzz around me in Ohio, West Virginia and Central Arkansas. They usually fly at night but there is a species that comes to the flowers on cloudy days and at dusk. Nicotiana seeds are very tiny, not much bigger than a speck, and are often pelletized by seed sellers to make it easier to see them. Nicotiana seeds can be planted straight into your garden after the last frost or started inside for transplanting later. Let the flowers go to seed and you’ll have new plants pop up next year. Here I have placed paper towels in a cake pan, srinkled the seeds over the surface, spritzing them daily with fresh water and kept in a dark, 70 a 80F pantry. I started these seeds 5 days ago and they are starting to sprout now ( almost impossible to see). 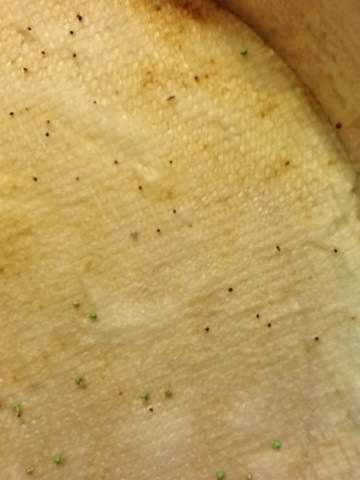 You can see that the pellet covering on the seeds has broken down with watering and dyed the paper towel somewhat. After my Nicotiana seeds have a good start I’ll take the paper towels with the sprouted seeds and lay them where I want them to grow in my garden, having prepared the soil ahead of time with added compost and a bit of coarse sand for drainage. Remember, Flowering Tobacco leaves, stalk and flower are poisonous and must be kept away from children and pets. When handling the plants, make sure to wear protective gloves because the plant does have a form of sticky nicotine on it’s green parts which could affect you in an unpleasant way if you got too much of it on your skin.